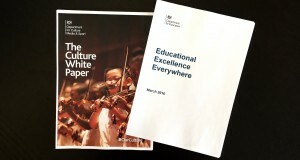 The Government recently published two White Papers of relevance to music education: one about culture and one about schools. They are vast and complex, so we’ve summarised the key points in a briefing paper about each. In this article, we also consider what the proposals in the White Papers mean for three things we care about: Early Years, young people in Challenging Circumstances, and Youth Voice. Beyond the Culture White Paper stating that the “government understands that a lifelong relationship with culture should start when people are young” there is little sign of anything relating to Early Years provision. Nonetheless there are questions lying beneath the surface. For example: might music within Early Years Foundation Stage teacher training be squeezed out even further with the advent of new training models? The Sound Connections London Early Years Music Network continues to campaign for increased recognition of Early Years music-making and all its benefits. We encourage you to add your voice to #EYinNPME, to see Early Years feature in the National Plan for Music Education. In the Education White Paper it falls to Pupil Premium to ensure that disadvantaged and vulnerable young people, who are most likely to face barriers to accessing music, are able to benefit from the arts at school. Whilst Pupil Premium provides potential opportunity for investment in the arts, there is much for all of us to do as advocates of music in schools to ensure that Senior Leaders and Governors believe in and enable high quality music education. Let’s make sure the opportunity presented by Pupil Premium is not overlooked. Whilst the Education White paper gestures towards more support for students with Special Educational Needs and Disability, the way in which these students’ needs will be met is vague, unclear and seemingly lacking solidity. Just two pages of a 123 page report are dedicated to SEN/D. ‘Challenging Circumstances’ spans a huge range of barriers to access. By our definition, Challenging Circumstances includes things such as Not in Education, Employment or Training, Looked After Children, and education in hospital schools. There is reference to Alternative Provision (AP) and ensuring “New, innovative and specialist provision”. Within the Sound Connections Challenging Circumstances Music Network there are practitioners doing powerful work in AP settings, such as Pupil Referral Units, that demonstrate how music can have a transformative impact on the lives of young people who find themselves excluded from mainstream schooling. Is it too optimistic to hope that these musical skills and approaches might be part of such innovative provision? It is refreshing in the Cultural White Paper that the importance of the arts in and out of school is recognised. There is also a clear and much-needed focus on reaching those who are currently on the periphery of the arts. That said, is funding most effectively being targeted to those who need it most? Let’s not forget Matt Griffiths’ (National Foundation for Youth Music) wise words about ‘targeted rather than universal subsidy’ referenced in this blog. Finally we think that the emphasis currently placed on playing an instrument and learning classical music needs to shift so that all genres, styles, musical backgrounds and heritages are reflected. It’s only then that the needs and interests of all children and young people can truly be met and we can reach those currently missing out. It sounds obvious but let’s not forget that, particularly in the case of the Education White Paper, it’s children and young people who will ultimately feel the impact of change. It’s therefore disappointing (though not altogether surprising) that decisions are made and changes ‘done to’ young people with little sign of consultation. This is something we continue to challenge and combat. Wired4Music (the music network for Londoners aged 16-25, hosted by Sound Connections) recently consulted with young people to find out what they think about the EBacc and music in schools. To find out what they had to say, read the consultation report. Overall one of the biggest frustrations is that ambitions outlined in the Culture White Paper aren’t supported or made possible by the mechanisms and approaches outlined in the Education White Paper. This leaves us knowing there is a big job ahead to ensure all children and young people, regardless of background and circumstance, can enjoy rich and relevant musical experiences.